Toss butternut and purple potatoes in extra virgin olive oil to coat. Season with salt and black pepper and roast for 10 to 15 minutes or until they're cooked. Set aside. Bring a large pot of water to a rolling boil. Season generously with salt. 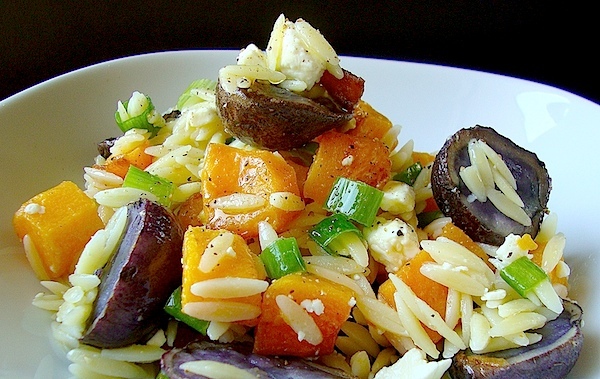 Add orzo to cook until al dente (don't over cook! ), about 8 minutes. Drain and rinse well with cold water. In a deep sided pan, drizzle about two tablespoons of extra virgin olive oil. Add orzo, garlic, and cooked vegetables when oil is hot. Toss quickly to heat all the ingredients. Season with salt and black pepper. Add salad to a large serving platter. Stir in feta crumbles, toasted pine nuts (optional) and green onions. Drizzle with Lemon Vinaigrette and serve warm. Gently whisk olive oil, fresh lemon juice, honey, mustard, and fresh garlic to combine. Season with salt and black pepper to taste. Oh my...this looks like I will love it!!! I love Orzo, it is so versatile! What a great post :) and the dressing sounds perfect! Another great Mia creation!! Love the colors in this! Perfect for fall. Oh Mia - great recipe! I love orzo, especially in salad! Everything about it. One note though... pine nuts should never be optional!!! :)haha. They are so incredible. Also, where did you ever find baby purple potatoes?? Buzzed! Roasted Whole Garlic and Roma Tomato Salad. Did Science Build A Better Turkey? Does The U.S. Government Subsidize Junk Food?